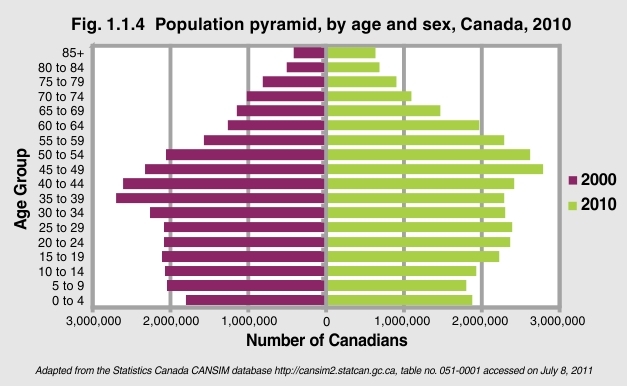 Looking at the total population of Canada by age group for 2000 compared to 2010 illustrates the overall trend towards an aging population. For the ten year period 2000 to 2010 there was a 5% decrease in the population aged 0 to 14 years while the population aged 15 to 24 increased by 10%. At the opposite end of the spectrum the number of those aged 80 and over increased by 48% from 2000 to 2010. The baby boomer “bulge” can be seen moving from age 35 to 44 in 2000 to age 45 to 54 in 2010. The increasing life expectancy of Canada’s older population and retirement of the aging baby boomer generation will create challenges for Canada’s economic and health care system in the future.